Irish Landscape Artist: Biography, Paintings. 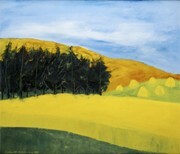 The Irish landscape artist Sean McSweeney, one of Ireland's leading painters, was born in Dublin in 1935. Despite not attending art college or taking any classes in painting, he began exhibiting his pictures regularly in the 1960s, in the Irish Exhibition of Living Art and the Oireachtas. McSweeney has also had five one-man shows at the Dawson Gallery in Dublin (from 1965 until 1977), ten solo shows at the Taylor Galleries in Dublin, and numerous others at the Kenny Gallery in Galway, Vanguard Gallery in Cork and at the Fenderesky Gallery, Belfast. McSweeney participated in many group exhibitions of Irish painting including: Celtic Triangle (1971); The Delighted Eye, Earlham Street Gallery, London (1980); 14th Cagnes-Sur-Mer Painting Festival (1985); Contemporary Artists from Ireland, Austin Desmond Fine Art Gallery, London (1990); Painting Landscape, Fenderesky Gallery, Belfast (2001). In 1990, Sean McSweeney had a retrospective exhibition organized by the Galway Arts Festival which travelled to the Royal Hibernian Academy Gallagher Gallery, Dublin and other venues in Ireland. In 1996, McSweeney had a two-person exhibition with sculptor Conor Fallon in the RHA Gallagher Gallery and the Model Arts and Niland Gallery, Sligo. Sean McSweeney's landscape painting focuses on the phenomenon of the bog pool - deep rectangular incisions in the surface of the bog that are caused by the practice of harvesting turf - and the rugged Sligo coastline. He lives and works in Ballyconnell, Sligo, from where most of his artistic inspiration derives. During his career as a painter, Sean McSweeney has won numerous awards including: the Oireachtas Award (1968), the George Campbell Travelling Award (1980), the Carroll Award, IELA (1987), a Winner's Medal for the Claremorris Open Exhibition (1987-8), and in 1989 he was awarded Bonn An Oireachtas. He is a member of Aosdana and his work is represented in the collections of the Arts Council of Ireland; the Crawford Art Gallery, Cork; the Hugh Lane Gallery, Dublin; the Ulster Museum, Belfast; Aer Lingus; Art Council of Northern Ireland; Dublin City University; Sligo Museum and Art Gallery; Trinity College Dublin. The auction record for a work by Sean McSweeney was set in 2007, when his landscape painting, entitled Summer Fields, was sold at James Adams, in Dublin, for €18,000.  For details of other semi-abstract landscape painters, see: Irish Artists: Paintings and Biographies.  For more about contemporary landscape artists like Sean McSweeney, see: Irish Art Guide.  For more about plein-air painting, see: Homepage.